TACLOBAN, Philippines Bloated bodies lie in the streets, in front of houses, on bridges, in the water, wherever the giant wall of water happened to dump them when Typhoon Haiyan hit. The desperate survivors scrounging for food amid the mountains of debris use cloth to shield their noses from the overpowering stench of rotting corpses. 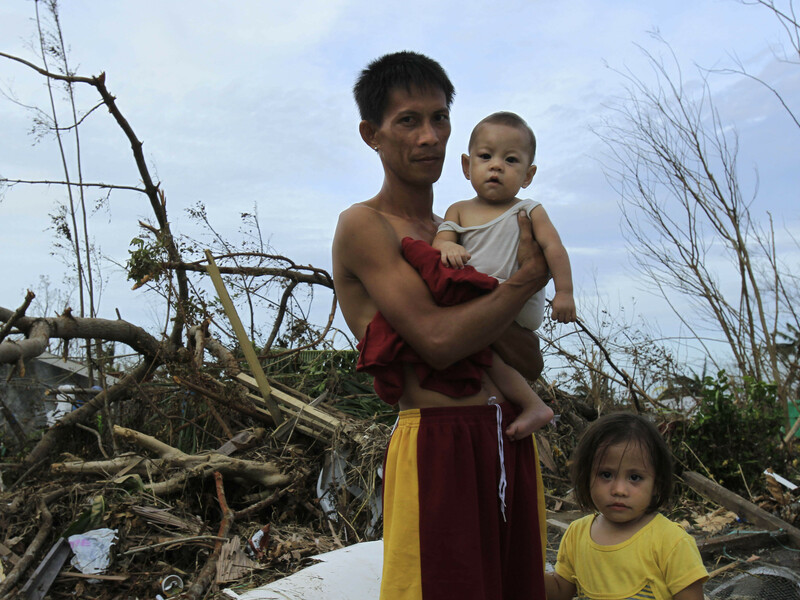 Some relatives have been trying to bury their dead, but in too many cases, there is no one to cart away the corpses littering the city of Tacloban, which was all but decimated by one of the most powerful storms to ever make landfall. "Those are dead people in front of our house and the smell is awful," a woman told a reporter from The Guardian newspaper. "The sister of the dead man came to see her brother, but she couldn't take him away, she just cried. What else can she do?" the woman asked. "There is nowhere to take him, nothing to do." The typhoon struck Friday with 147-mph winds and a 20-foot fall of seawater. Authorities estimate the storm killed 10,000 or more people, but so far no one has been able to count all the bodies. And with shattered communications and transportation links, the final count was likely days away. Presidential spokesman Edwin Lacierda said "we pray" it does not surpass 10,000. The government raised the official death toll Tuesday to 1,744, with the final number expected to be much higher. The National Disaster Risk Reduction and Management Council also said 2,487 people were hurt. Authorities estimated that the storm displaced about 660,000 others. "I don't believe there is a single structure that is not destroyed or severely damaged in some way - every single building, every single house," U.S. Marine Brig. Gen. Paul Kennedy said after taking a helicopter flight over Tacloban, the largest city in Leyte province. He spoke on the tarmac at the airport, where two Marine C-130 cargo planes were parked, engines running, unloading supplies. "Help. SOS. We need food," read a message painted by a survivor in large letters on Tacloban's port. In the ravaged city, residents stripped malls, shops and homes of food, water and consumer goods. Officials said some of the looting smacked of desperation but in other cases people hauled away TVs, refrigerators, Christmas trees and even a treadmill. An Associated Press reporter said he saw about 400 special forces and soldiers patrolling downtown to guard against further chaos. Kennedy said Philippine forces were handling security well and U.S. troops were "looking at how to open up roads and land planes and helicopters" in order to bring in shelter, water and other supplies. Other survivors were anxious to get word to relatives. "Please tell my family I'm alive," said Erika Mae Karakot as she stood among a throng of people waiting for aid. "We need water and medicine because a lot of the people we are with are wounded. Some are suffering from diarrhea and dehydration due to shortage of food and water." Philippine soldiers were distributing food and water, and assessment teams from the United Nations and other international agencies were seen Monday for the first time. The U.S. military dispatched food, water, generators and a contingent of Marines to the city, the first outside help in what will swell into a major international relief mission. The United States has pledged $20 million in immediate aid and has ordered the aircraft carrier USS George Washington to the sail to the Philippines to provide assistance in the wake of the typhoon. It was expected to arrive in about two days. A similar sized U.S. ship, and its fleet of helicopters capable of dropping tons of water daily and evacuating wounded, was credited with saving scores of lives after the 2004 Asian tsunami. Emily Ortega, 21 and about to give birth, said she clung to a post to survive after the evacuation center she fled to was devastated by the 20-foot storm surge. She reached safety at the airport, where she gave birth to a baby girl, Bea Joy Sagales, whose arrival drew applause from the military medics who assisted in the delivery. The wind, rain and coastal storm surges transformed neighborhoods into twisted piles of debris, blocking roads and trapping decomposing bodies underneath. Cars and trucks lay upended among flattened homes, and bridges and ports were washed away. "In some cases the devastation has been total," said Secretary to the Cabinet Rene Almendras. Those caught in the storm were worried that aid would not arrive soon enough. "We're afraid that it's going to get dangerous in town because relief goods are trickling in very slow," said Bobbie Womack, an American missionary from Athens, Tenn. "I know it's a massive, massive undertaking to try to feed a town of over 150,000 people. They need to bring in shiploads of food." Womack's husband, Larry, said he chose to stay at their beachside home in Tacloban, only to find the storm surge engulfing it. He survived by climbing onto a beam in the roof. "The roof was lifting up and the wind was coming through and there were waves going over my head," he said. "The sound was loud. It was just incredible." Marvin Daga, a 19-year-old student, tried to ride out the storm in his home with his ailing father, Mario, but the storm surge carried the building away. They clung to each other while the house floated for a while, but it eventually crumbled and they fell into churning waters. The teen grabbed a coconut tree with one hand and his father with the other, but he slipped out of his grasp. "I hope that he survived," Marvin said as tears filled his eyes. "But I'm not expecting to find him anymore." Haiyan hit the eastern seaboard of the Philippines on Friday and quickly barreled across its central islands, with winds that gusted to 170 mph. It inflicted serious damage to at least six islands in the middle of the eastern seaboard. The storm's sustained winds weakened to 74 mph as the typhoon made landfall in northern Vietnam early Monday after crossing the South China Sea, according to the Hong Kong meteorological observatory. Authorities there evacuated hundreds of thousands of people, but there were no reports of significant damage or injuries. It was downgraded to a tropical storm as it entered southern China later Monday, and weather officials forecast torrential rain in the area until Tuesday. The country's deadliest disaster on record was the 1976 magnitude-7.9 earthquake that triggered a tsunami in the Moro Gulf in the southern Philippines, killing 5,791 people.